Setting Prepared piano and prepared trio: flute, clarinet in Bb and cello. Period of creation 2010-11-02 to 2010-12-11, revision: 2011-03-27 to 30 and 2012-05-25 to 06-03 and 2013-01-15 to 20. Commission / occasion Commissioned by the Badisches Staatstheater (Insel) in Karlsruhe (Ger). The main idea behind the work Incontro Concertante is to combine the rich sound world of prepared musical instruments on a chamber-musical level with the classical concertante idea of dialoguing or contesting. 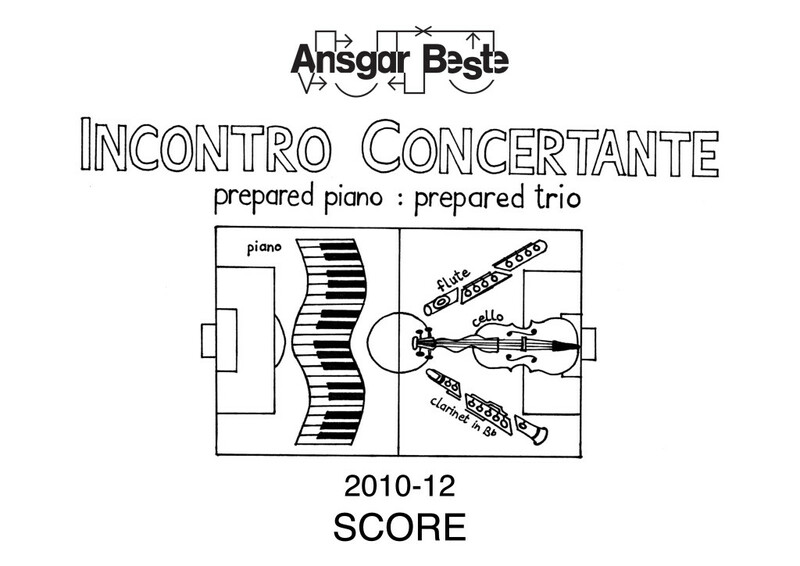 In a sometimes speedy, sporty and lively match the prepared piano as a soloist is confronted with the opposing team of the prepared trio consisting of flute, clarinet and cello. Analogous to the opening tutti exposition of the classical solo concerto, the trio dominates the musical happenings right at the beginning, it starts even with its strongest climax in the entire piece containing continuous, distorted fortissimo sounds in the high register. During the 1st third the trio progressively fades into the back­ground and reaches its first, largely toneless anticlimax in bar 61, at the same time the most mysterious passage of the entire match, which is, how­ev­er, still formed by continuous sounds (e.g. air sounds, bowed sounds of a knitting needle, silent harmonics). In the 2nd third the trio proceeds to to an increasingly rhythmized upward vortex und finally arrives at its 2nd climax in b. 121, which, in turn, thanks to its rhyth­mi­cal-repetitive characteristics, announces the now emerging decadence and the final, percussive-toneless anticlimax at the end of the last third. In contrast to the classical solo concerto, the piano does not start its own solo exposition after the tutti exposition, but cautiously feels its way towards the happenings in the 1st fifth, pushing itself into the foreground until its first climax consisting of string attacks (b. 37). At the end of the 2nd fifth a mysterious anti­cli­max made of harmonic sounds on the strings is reached, nearly simultaneously with the trio. Stimulated by this common fate, the piano tries to come to terms with the opposing trio in the 3rd fifth and, with united forc­es, sets itself up to the next climax (b. 109) consisting of key scales. The antagonist of this middle section is now called the silence of the resonance in general pauses of variable duration. While the trio is still heading for its last climax at the beginning of the 4th fifth, the piano already fades away, before pulling out all the stops in the last fifth and heading for the final and maximal climax, made of cluster glissandos (and total clusters, see below) on the keys. The texture of both teams is formed by sonic leitmotifs, which are present during the entire piece, but which increase in density (and on the piano also in dy­nam­ics) at the respective climaxes: On the piano, it is the sonic motif of the total cluster on the complete keyboard, e.g. dominating the final bars, for the trio the leitmotifs are attack sounds, i.e. jet whistle (flute), teeth on reed (clarinet) and the pressed bowing on the strings (cello). In the particularly heterogenous passages at the beginning and at the end of the work, the teams act on a rotating basis, i.e. the weaker part always makes use of the rests of the stronger one to find a sympathetic ear. In the middle passages, dynamically rather homogenous and balanced, the antagonists act si­mul­ta­ne­ous­ly. Finally, if the trio on the one hand comes out as loser after a powerful kick-off phase and some desolate closing minutes and if the piano on the other hand comes out as winner after a sleepy start and a fulminant final, this questions is completely left to the judgment of the listeners. 5% Selection (Swe) for the ISCM World New Music Days 2013, 3/60 and nomination for the ISCM Young Composer Award (2012-06). 17,24% Selection by the Schallfeld Ensemble (Aut) for a workshop at the 48th International Summer Course for New Music in Darmstadt (Ger), 5/29 (2016-05). 18,42% Selection for the festival UNM (Young Nordic Music) 2012, 7/38 (2011-12). 20% Selection by the Ensemble Platypus Vienna (Aut), 15/75 (2012-04). 20% Selection (Swe) for the Nordic Music Days 2013, 60/300 (2013-04). 20% Shortlisted (Swe) for the ISCM World New Music Days 2013, 12/60 (2011-12). 37,5% 2nd prize at the Hanns Eisler Prize for performance 2012 in Berlin, 3/8 (2012-06). 100% Selection for the project Preparkert Piano at the Oslo Culture Night 2016, 2/2 (2016-09) [piano part]. duration: 2 min 8 sec. duration: 2 min 19 sec.